Home » Business • Community » Local Realtor is a reality TV star! Local Rainbow Beach Realty estate agent, Andrew Hawkins will be featured in an upcoming reality television show, House Hunters International. Filming took place in and around Rainbow Beach between June 3 and 6 of this year. 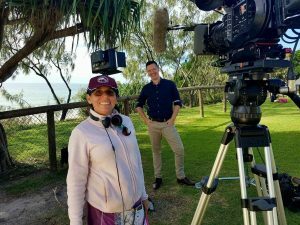 When the show is eventually aired on Channel 9 Life, viewers will witness a young couple selecting their ideal home on the Cooloola Coast, according to location and budget. “Anita, the producer of the show is from Itchy Feet Media, and contacted me to coordinate filming. Anita was already familiar with Rainbow Beach as she comes from Kin Kin. She is very fond of holidaying here and very happy to be showing the world Rainbow Beach,” he said. Andrew explained about the young couple interested in moving here, Jimmy hails from Gympie so he is very excited to be bringing his fiancé Bailey back to live in the area. “Bailey is originally from the US and the pair met whilst holidaying in Spain. This is not the first time Andrew has been featured on an international realty TV show. In 2012, House Hunters International approached him and filmed a similar show. We asked Andrew why Rainbow Beach was selected twice? “Rainbow Beach is an amazingly beautiful part of the world and the local real estate market continues to improve, reflected by growing buyer interest and property sales across the entire spectrum of properties,” he explained. “We are definitely going to experience a good year for the Rainbow Beach property market,” he said.